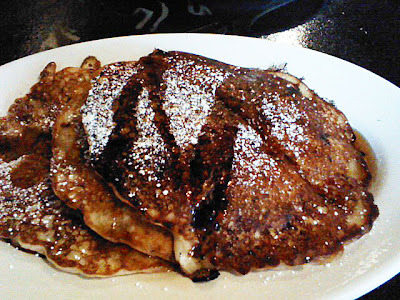 I’m going to keep my review of breakfast at Flat Top Grill pretty short: unless you enjoy eating lots of bland flavorless food at breakfast then avoid Flat Top Grill and go for lunch or dinner instead. 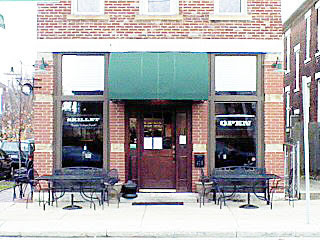 I reviewed dinner at this restaurant a couple of weeks ago and raved about the food and service. I was initially thrilled to see that they had a create your own breakfast on the weekends and couldn’t wait to try it. I’m sad to say how disappointed I was with the food this time around. Service was still very welcoming and friendly. They also do not have a one-dish option at breakfast (they do at lunch and dinner), only an all-you-can-eat. For those of us who eat a normal breakfast this probably isn’t the best value anyway at $9.99 a person ($8.99 for students) which doesn’t even include a glass of juice, milk or coffee.You have an option to make your own omelette, pancake, scramble or french toast with a variety of items from the “bar”. They also have self-serve oatmeal. I was disappointed with the fruit selection for the french toast and pancake options. The pineapple was canned and the strawberries out of season and tasteless. 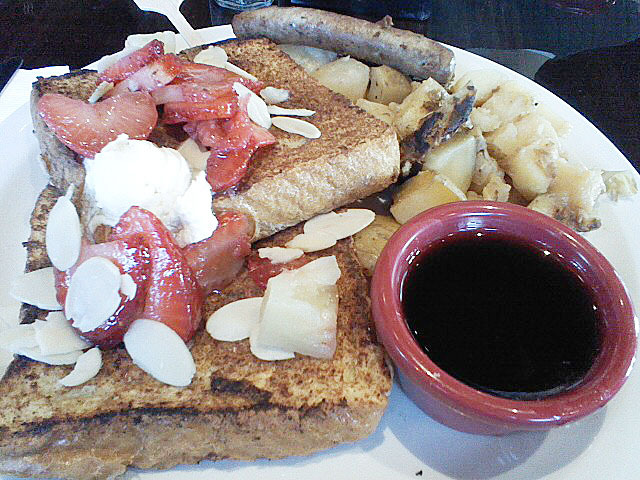 “Bland” pretty much summed up the french toast as well as the pancakes and the oatmeal, even with the toppings . Nothing stood out food-wise here. The potatoes were beyond mushy and the sausage was flavorless. Unfortunately, since it looks like Flat Top Grill doesn’t know how to make a good breakfast we won’t be back in the future for any morning meals. However, they are much better with savory foods so we’ll definitely be back soon for lunch or dinner! I’ve been a fan of Bagger Dave’s and their burgers since they first opened a location in Ann Arbor a couple of years ago. When I found out that one of the newer Bagger Dave’s, located in Novi, was a testing ground for serving breakfast I felt the need to drive out there to determine if it measured up to the rest of the food I’ve come to enjoy. If you’re familiar with their build-your-own burger concept then you’ll feel right at home with ordering breakfast here. They have a similar idea of build-your-own breakfast sandwich or bowl scramble, along with some al a carte items such as oatmeal, flavored pancakes, muffins and toast. For the build-your-own you mark on a printed sheet what goodies you want to add to your breakfast creation: meat, type of bread (or scramble bowl), cheese, sauce, premium toppings (if you so choose) and there are a variety of free toppings as well. All create-your-own sandwiches come with a fried egg on top, or an egg white if you prefer. I ordered my own breakfast sandwich creation on a wheat bagel with an egg white, turkey sausage, cheddar and sauteed mushrooms. I skipped the sauce option, partly for calories and partly because I wasn’t quite sure which might work best for a breakfast sandwich. I really appreciate that they give you the option of an egg white instead of a fried egg without an extra charge. It’s healthier and I’m not really a fan of gooey egg yolk on my morning sandwiches. The bagel was fresh and soft, the sausage was flavorful and filling. I enjoyed my sandwich, though I’ll admit that I prefer their burgers a bit more. Maybe because I feel like I can get away with adding more creative items to a burger and not regret it later. I’ll admit that I was a bit timid when creating my first breakfast at Bagger Dave’s. My husband and I shared a bag of Dave’s Diced Potatoes which come with a dipping sauce that includes a mix of sour cream, bacon, onions and spices. Our waitress was nice enough to point out ahead of time that we could easily share one portion of potatoes rather than ordering two separately. These are little nuggets of potato goodness best eaten with fork and dipped lightly in the sauce. A word of warning, the accompanying sauce is HEAVY on the onion. 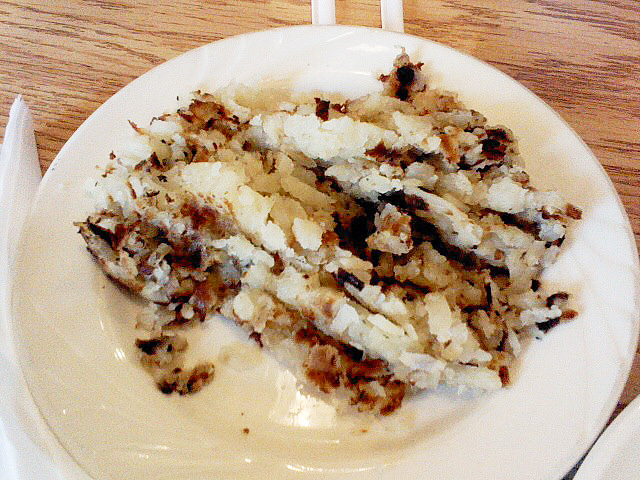 That aside, the combination was a nice change from your typical hash browns. They had a fairly light breakfast crowd the Saturday we stopped in. It may not be well advertised, we just happened to notice a sign outside the building when we passed by a few weeks ago. Finding the breakfast menu on the website is a little challenging, it’s lumped in with the regular menu a few pages in. Only one waitress was seating people and taking orders, but she did a remarkable job. Timing on everything from drink orders, to ordering to the arrival of food was very smooth. We went away full and happy. 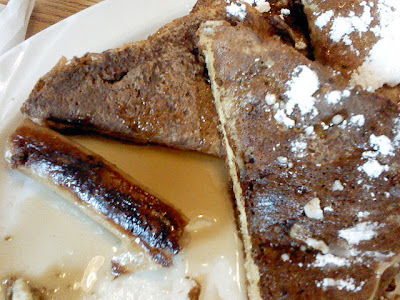 I’ll be emailing Bagger Dave’s to ask if they would consider adding breakfast to the Ann Arbor location soon. 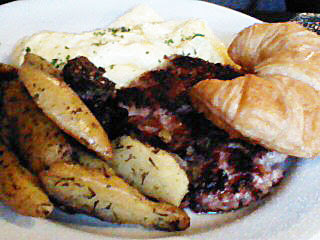 I think it would do well there, though the breakfast menu is geared more toward meat eaters than vegetarians. 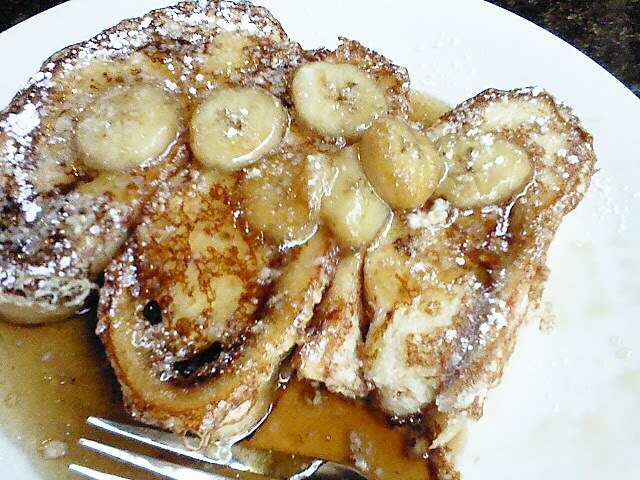 The Banana Foster’s French Toast at Tasi Cafe in downtown Coumbus is so darn good that it deserves a second review. Well that, and the fact is I couldn’t bring myself to order a different dish when were were in town last week. 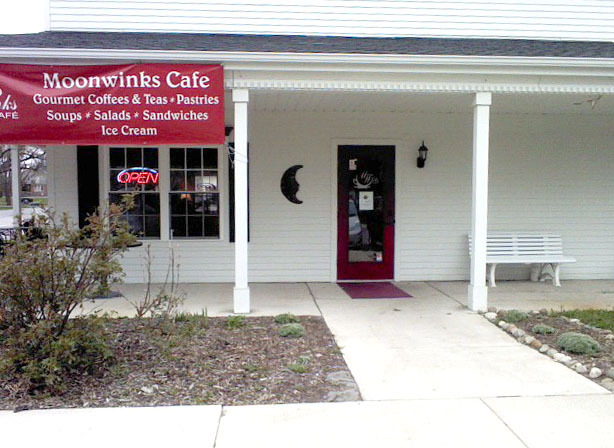 This delightful little gem of a cafe is hidden in an alley in downtown Columbus. If you don’t know it’s there you’ll miss it. They serve breakfast and lunch. The breakfast is fabulous and I have yet to try lunch there, but I’m sure it’s just as good. The only trick is to get here early for breakfast because by 8:30 on a weekday the tables are full and the line is out the door. Parking can be tough so you may want to park on High Street and walk over. I was somehow doubting my choice after ordering the French toast before it arrived, wondering if I should have gone for the caramel roll; which I’ve had the past and it was especially tasty. But, after one bite of this excellent breakfast dish I no longer had any regrets. The caramel flavor of the roll was in the French toast. I’m not sure I noticed that flavor the first time I had this, but I think that’s what makes it so good. The bananas are caramelized and their flavor and caramel syrup fill every bite. I’m usually a wimp when it comes to enjoying a latte straight up with no sugar added. My particular vice is a caramel latte (seeing a theme here?). 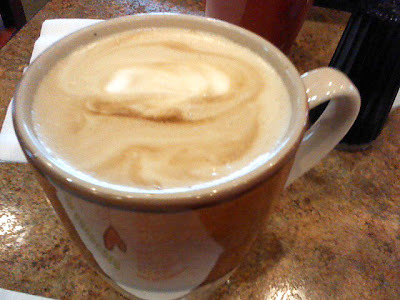 Tasi Cafe does not add syrup to their lattes, though they may have mochas. 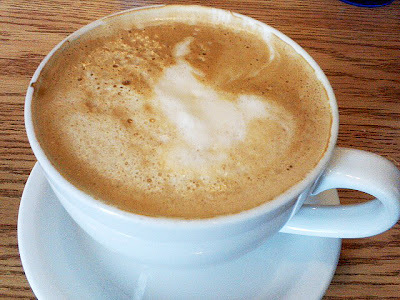 I decided to give a plain latte a shot anyway and add some Sugar in the Raw so I could get my morning caffeine fix. 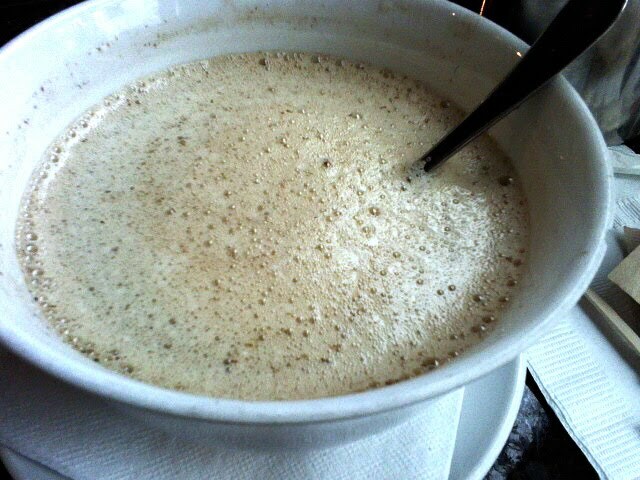 They use Illy espresso and serve the latte in a soup bowl. When it arrived at my table the bowl was piping hot and came with a small spoon. I felt a bit silly sipping my latte off a spoon, but the taste was delicious. I missed the caramel a bit, but it allowed me to really appreciate the quality of the espresso they use. I think the soup bowl, without handles, was their attempt at being modern. I would have preferred they use a cup with a handle so I could drink my coffee the traditional way rather than relying on a utensil as the vehicle, which was a bit awkward. Next time I’ll ask for it in a cup to go. Well, despite my coffee experience on this trip, we’ll definitely keep coming back. The food is fantastic and the service is really quick. I’ll make a point of stopping for lunch next time sometime after breakfast. I can’t wait to see how their sandwiches and lunch entrees stack up to the first meal of the day here. I’m now in the good company of Anthony Bourdain having finally tried Taste Our Goods (or “togs”, as my husband has lovingly dubbed it) in Kerrytown this weekend. Although, I think Mr. Bourdain had lunch there and I’ve tried their breakfast so far. This sweet little breakfast and lunch counter tucked into the back corner of Sparrow Market has a good thing going. What a creative menu and nice change from overpriced and overrated Ann Arbor diner breakfasts. The woman who greeted us on Saturday was very friendly and helpful. She told us it would be about 10 minutes before our meals were ready and said they could bring it out to us or check back if we liked. We popped across the way to grab a table and get some coffee from Sweetwaters. I tried out Taste or Goods’ Sweet Hash Dude, a great deal for only $7. Shredded sweet potato mixed with onions, mushrooms, bell pepper, dabbed with goat cheese and topped with eggs of my choice (I had them over medium); a fruit cup and a side of toast (Farmer’s for me) were also part of the deal. All I can say is “yum!”. Great flavors in the hash and the fruit, though mostly blueberries, was fresh and seasonal. I did have to request some jam to go with the toast, but this was a very tasty breakfast stop. 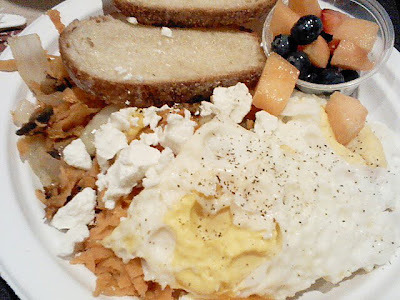 I even liked the eggs which I don’t usually enjoy because it’s not my favorite food on its own. I’m looking forward to a lunch visit soon!